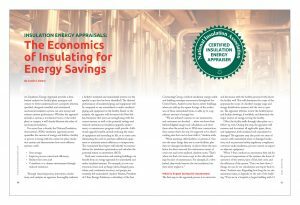 An Insulation Energy Appraisal provides a data-backed analysis for facility/plant managers and owners to better understand how a properly selected, specified, designed, installed, and maintained mechanical insulation system can save money and enhance system performance. Whether the appraisal includes a system, a mechanical room, or the entire plant or campus, it will clearly illustrate the value of mechanical insulation. • Contribute to a cleaner environment through reduced emissions. Through visual inspection, interviews, calculations, and analysis, an appraiser thoroughly evaluates a facility’s insulated and uninsulated systems (or the specific scope that has been identified). The thermal performance of insulated piping and equipment will be compared to any uninsulated or under-insulated piping and equipment in the facility. Based on the analysis, the appraiser will document the Btus/dollars/emissions that users are saving/losing with the current system, as well as the potential savings and reduced emissions an insulation upgrade, replacement, or maintenance program could provide. Additional upgrade benefits include reducing the strain of equipment and extending its life, or in some cases eliminating the need to purchase additional equipment to maintain system efficiency or temperature. The customized final report will identify recommendations for insulation optimization and calculate the potential return on investment (ROI). Both new construction and existing buildings can benefit from an energy appraisal for uninsulated and under-insulated systems. For example, in new construction, items such as flange valves, flanged pairs, valves, and condensate receivers, and pumps, are routinely left uninsulated. Andrew Martin, President of I-Star Energy Solutions, a subsidiary of the Irex Contracting Group, conducts insulation energy audits and building envelope assessments throughout the United States. Andrew notes that in newer buildings when you add up the square footage of the surface area of those uninsulated items, it adds up to a significant amount of energy loss. “We use infrared cameras on our assessments, and customers are shocked. . . when we show them infrared/digital images and calculations and show them what the actual loss is. With new construction, they assume that’s the way it’s supposed to be, there’s nothing else that can be done with it,” Andrew adds. The first step in the appraisal process is an interview and discussion with the facility personnel who know the facility well. This will determine the scope of the appraisal, the scope of a facility’s energy usage and energy distribution systems, and the cost to operate. The appraiser will also review the facility layout and facility drawings, if available, and determine the major sources of energy serving the facility. Often the facility walk-through takes place on a follow-up visit. During this step, the appraiser will measure and document all applicable pipes, ducts, and equipment, both insulated and uninsulated or damaged. The appraiser may also point out areas of concern with uninsulated areas or damaged insulation, such as personnel safety, regulatory compliance, corrosion under insulation, process control, or impact on adjacent equipment. When I-Star conducts an assessment, they ask for the process temperatures of the systems, the hours of operation of the system, type of fuel, fuel costs, and the efficiency of the system. “Once we have those 5 things, we can do our calculations and report back to them,” Andrew says. Regarding how long the on-site assessment takes, it depends on the size of the building. “If we are in a hospital or larger building with 12 stories and multiple mechanical rooms, it could be multiple days. If there’s only 1 building, it may only take a few hours. We don’t tie anybody up—we are on our own,” Andrew notes. For I-Star, once they have gotten the customer information and completed their on-site assessment, they can generate the final report in approximately 10 business days. What Will the Final Report Cover? The appraiser will present a customized report and explain all financial savings information and energy and environmental data. Reports may also include infrared images that visually capture heat loss. • Btu or energy loss/gain from a pipe or vessel if it is insulated to the most thermally efficient, yet cost effective, thickness determined by the 3E Plus program. The appraiser may identify recommendations based on the analysis and discuss the potential ROI from an insulation upgrade or replacement or from implementation of a timely and effective mechanical insulation maintenance program. If requested, the appraiser can also provide a professional estimate regarding any insulation recommendations. When asked what customers typically do upon receiving their report, Andrew sees several typical responses. “Some say, ‘Wow, that’s a lot of loss. We’ll try to budget for it in the future.’ Those who are ready to take action may say, ‘This is great. I can take it up the ladder. I have the proof I need to get the funds.’” Andrew says people generally know there is a problem, but don’t know the extent of it. NIA currently has nearly 500 certified Insulation Energy Appraisers throughout the United States, and approximately 325 work for NIA member companies. Certified appraisers receive intensive training through NIA’s Insulation Energy Appraisal Program. They can provide an accurate appraisal of your current insulated systems and recommend the steps necessary to achieve the best energy and cost savings and emission reduction possible. To find a NIA Certified Insulation Energy Appraiser in your area, please visit http://tinyurl.com/jr4wzf8.